MANILA, Philippines - TheSummitExpress.com, a reliable Philippine news portal is growing and with this comes the desire to look for a feature/trending news writer who has the ability to spot and create trend on social media. As a writer, expertise should focus on writing original stories/features and trending news or posts on social media (Facebook, Twitter, Instagram and Youtube). 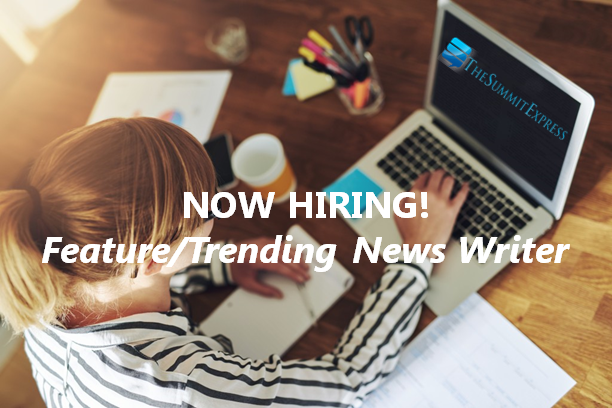 The writer must be social media or tech savvy and knows various social media platforms, has good writing skills and enthusiasm to deliver the freshest stories ahead of the competition. The writer should have basic background on search engine optimization (SEO), knows the nature of blogging, basic HTML coding, photoshop or any image editing app or software, and willing to contribute report in any time of the day. 1. This is part-time job only and you will work from the comfort of your home. 2. Knowledge on writing about politics, entertainment or sports is a plus. Are you the one we're looking for? Interested applicants may send their resume and sample writing/s to admin@thesummitexpress.com. Use "TRENDING NEWS WRITER: "Your Name" as subject of email. As a writer, you will also get the opportunity to attend product launch (if Metro Manila resident), press conference and various events. Through media invites, you will enjoy lots of freebies, be the first to know about new product or announcement, VIP treatment and even see your favorite stars. In case you just want to contribute or share your talent with us by sending tip or story, visit this page. Join us as we continue to deliver the best stories, trending news and breaking reports for the Filipinos worldwide. The Summit Express which has been online since 2012 maintains its status as one of the leading news blogs in the Philippines. As of press time, the website has garnered over 82 million views since its launch. On Facebook, we have a growing community of around 176,000 followers.